Nonprofit news organization ProPublica is soliciting readers for more information about Brett Kavanaugh's affinity for Washington Nationals games, asking readers if they know who he attended games with and where he sat in order to fully vet the Supreme Court nominee. The Washington Post reported last month that Kavanaugh accrued between $60,000 and $200,000 in debt over three credit cards and a loan. The White House, which provided the financial disclosures leading to the report, said Kavanaugh purchased Nationals season tickets for himself and friends at the end of 2016, and then collected and paid off the debt in 2017. White House spokesman Raj Shah also said Kavanaugh had no debt beyond a home mortgage. The Washington Post, which led its report with the speculation Kavanaugh's liabilities could outnumber his assets, had to update its story to note the longtime judge also had a half-million dollar retirement account. ProPublica linked to the report, which is more than a month old, and briefly recapped the story before saying the "White House and Kavanaugh are not answering questions about what happened." "Who did Kavanaugh buy tickets for? How did they reimburse him? Was this properly disclosed? And how was all of this treated for tax purposes?" Ariana Tobin and Justin Elliott wrote. "Kavanaugh is up for one of the most powerful positions in the land. A lifelong position. We think it’s important to figure out as much as we can about a nominee’s background before he is confirmed. So we’re turning to you," the authors added. They said figuring out who Kavanaugh attended games with could be "relevant to his confirmation," although they stipulated it may "just affirm that the guy really does love baseball for the judicial inspiration." Brett Kavanaugh is up for a lifetime appointment on the Supreme Court. 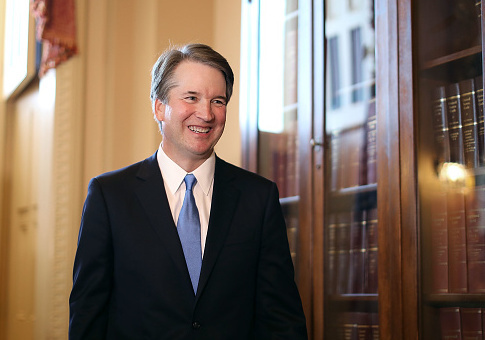 Kavanaugh is an avid baseball fan who has lectured about the similarities between a good judge and a fair umpire. Senate Democrats feel powerless to stop Kavanaugh from being confirmed, the Post reported last week. Although Senate Minority Leader Chuck Schumer (D., N.Y.) vowed to fight his confirmation with all his strength, no Republicans have signaled any intention to vote him down. This entry was posted in Politics and tagged Brett Kavanaugh, Media, Supreme Court. Bookmark the permalink.